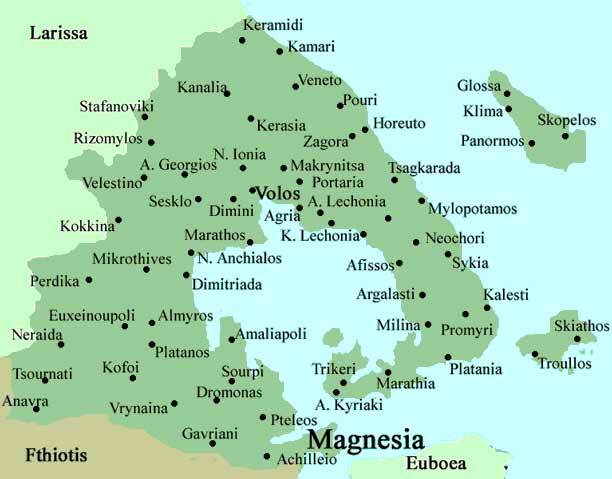 Magnesia, deriving from the tribe name Magnetes, is the name of the southeastern area of Thessaly in central Greece. The modern prefecture was created in 1947 out of the Larissa prefecture. About 70% of the population live in the Greater Volos area which is the second-largest city in Thessaly and the third busiest commercial port in Greece. Much of the population lives near the Pagasetic Gulf and in the eastern part. The chemical element, Magnesium, was named after the "City of Magnesia" by Sir Humphrey Davy in 1808. The capital of Magnesia prefecture is the metropolitan city of Volos. According to the most recent census (2001), the population stands at 207,000. The prefecture of Magnesia includes the Northern Sporades group of islands (Skiathos, Skopelos and Alonissos. The prefecture also includes the Alonissos Marine Park. The prefecture hosts 2,000,000 tourists annually.